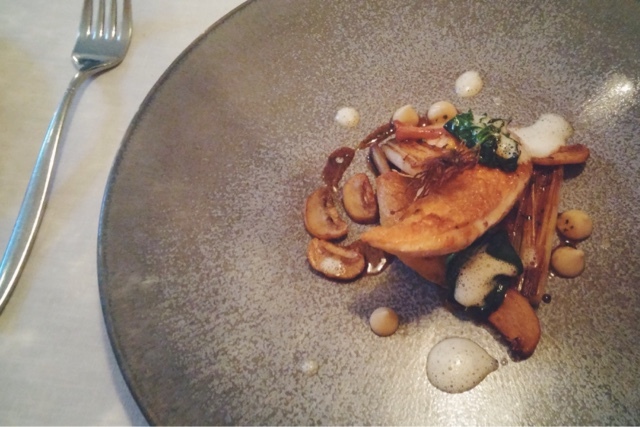 Pied à Terre, London | ivy eats again. I have a long list of restaurants that I want to go to. It gets longer by the week with so many new openings. 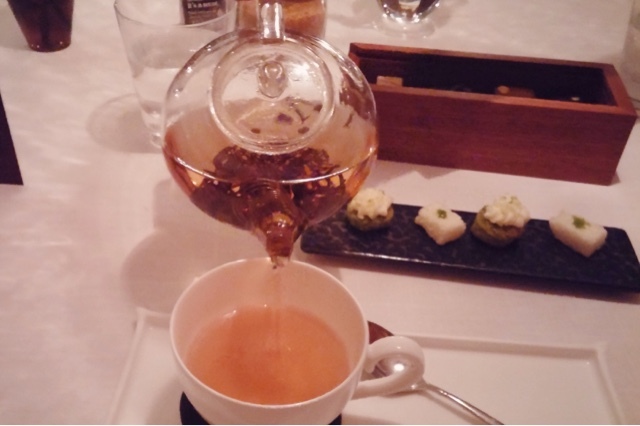 Pied à Terre is a one michelin starred restaurant, surprisingly it is not on my top of the list to go. Pied à Terre is the "bigger" sister restaurant to L'autre Pied which I visited earlier in the year and I had a great experience there. 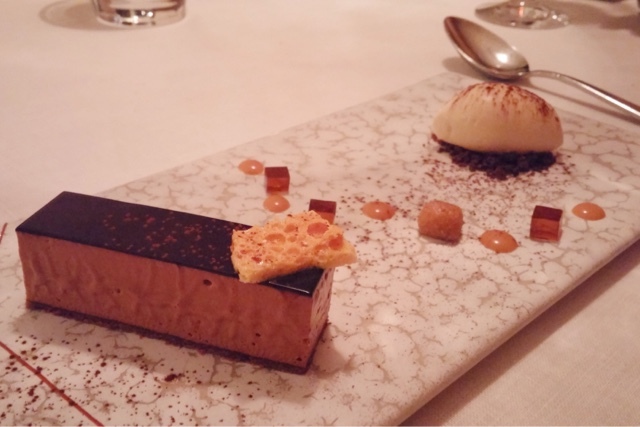 With Marcus Eaves as the head chef, I had high expectations, especially after L'autre Pied. 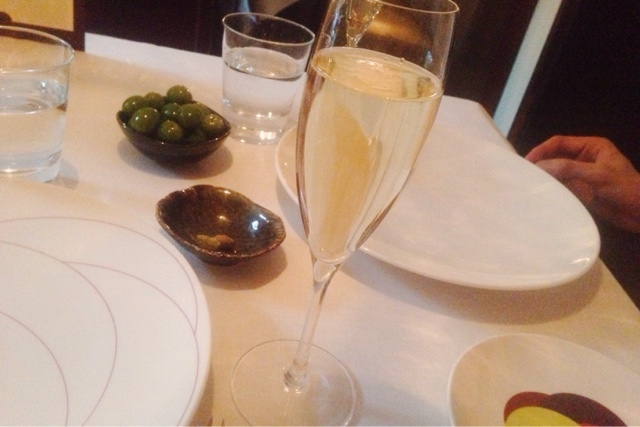 We actually bought the deal of 7 course tasting menu with a glass of champagne on Amazon for £49 priory to the meal. It seems a very good bargain, trying to attract more clients by offering the tasting menu at a lower cost. 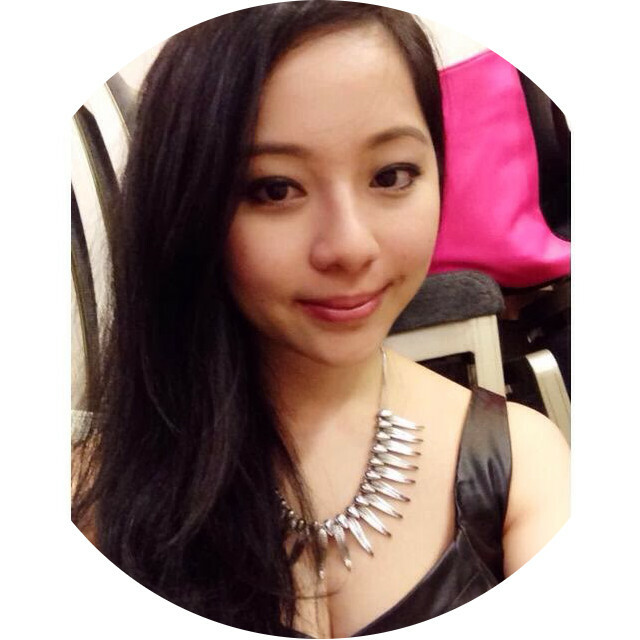 The only downside is the time restriction which you can only book it for certain time and certain day of the week. That didn't stop us from buying the deal. So on a Monday evening, we sneakily left work a bit earlier than usual for the 6:15pm sitting in our business attires. We were served a glass of champagne each upon arrival. 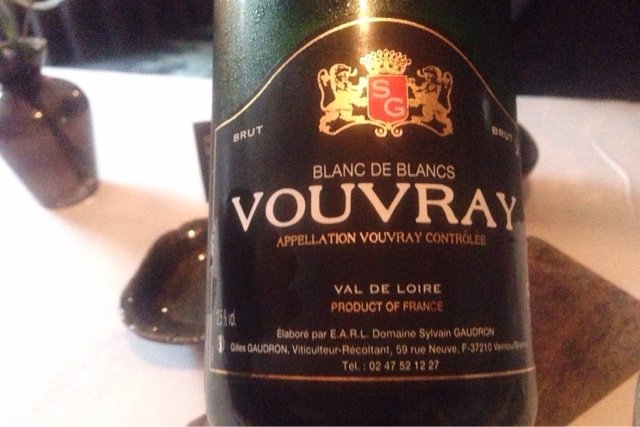 Correction, it's actually vouvray a sparkling wine from France and the one we drank is produced by same method as champagne so the second fermentation happens in the bottle. It's actually very good, especially being a blanc de blancs. 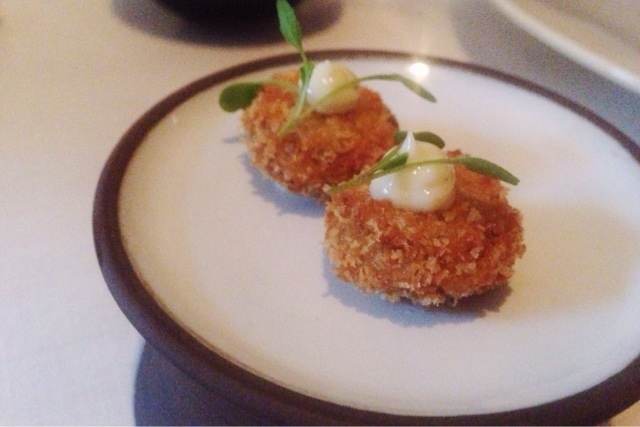 Amuse Bouche - Chicken Croquettes. 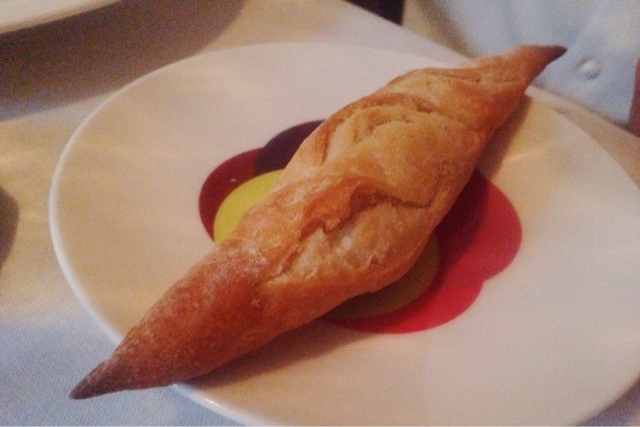 An array of amuse bouche and bread soon arrived. A miniature size of chicken croquettes left you wondering how do you make it so small, so crunchy with the chicken mousse inside leaving you wanting more. 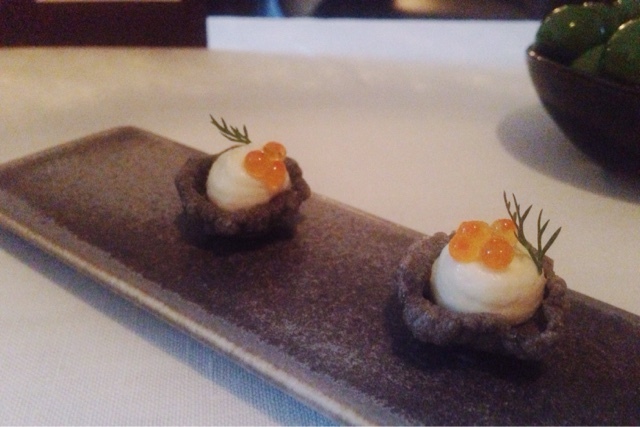 The prawn mousse on a squid ink wafer topped with fish roes has so many different textures, it was delightful. 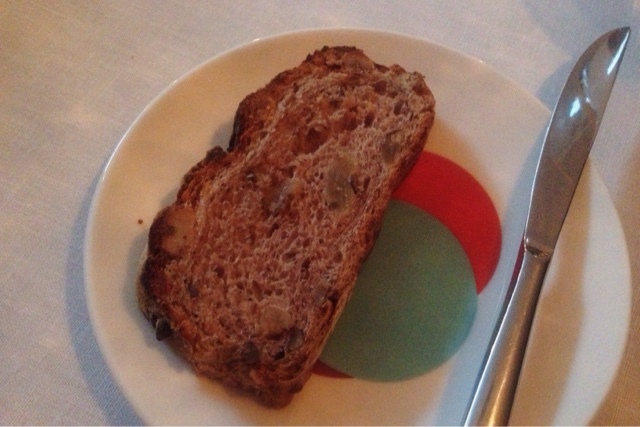 The bread selection is very good, white baguette, brioche, walnut & pumkin seeds bread and black treacle bread. 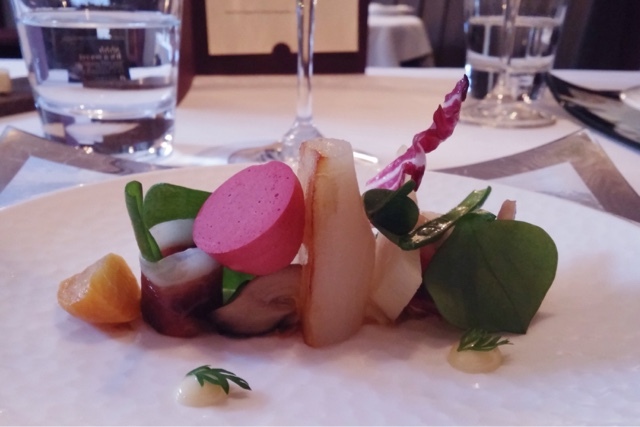 Salad of Spring Vegetables with Smoked Duck Breast, Garlic Mayonnaise and Shiitake Mushrooms. This was a dish that I could not take my eyes off, the plating is so beautiful. It was a very refreshing salad with lots of different textures. Smoked duck breast is very oily and flavoursome, it reminds me of ibérico ham. A playful beetroot meringue against other vegetables of soft and crunch. 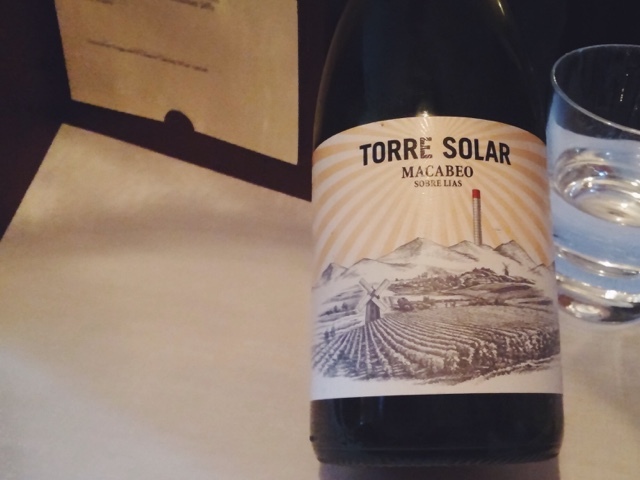 It was also a start of an exploding wine journey to the meal matched with Macabeo Sobra Lias, Torre Solar, Spain 2013. A hint of tropical fruits on the nose combined with crisp, refreshing acidity. I don't think I could get enough of this fantastic mushroom soup, intensified mushroom flavour and the aroma of truffle lingering in the mouth. The orzo pasta gives it an extra texture along with the cured Pyrenean ham adding another dimension. It can be a bit salty at the end from the intensive flavour. 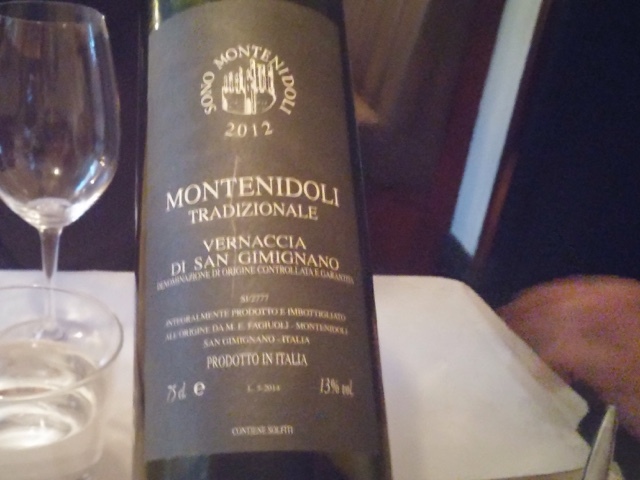 The wine that was paired (Montenidoli Tradizionale Vernaccia di San Gimignano, Italy 2012) cuts through the saltiness very nicely. It makes me drool just thinking about this soup. 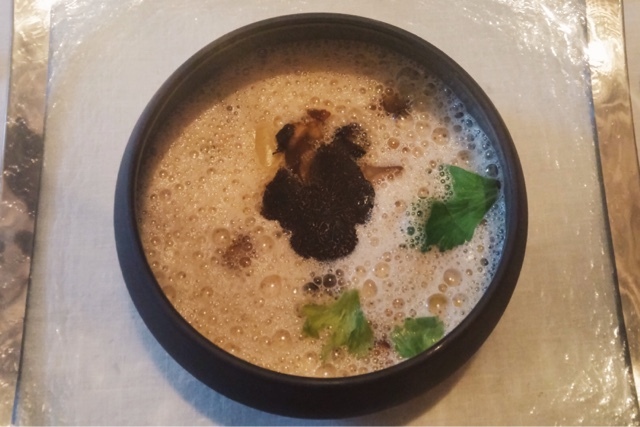 Intrigue to know how to make such a mushroomy soup now, definitely something I would want to replicate in my kitchen minus the cost of the truffle. There was something on this Poussin dish that I was not looking forward to, liquorice braised leek. I am not against the leek, it is the flavour of liquorice that I dislike. The poussin is cooked to perfection, still retaining its moist succenlant meat. Well balanced dish and seasoned nicely. How happy was I, in fact I could barely get that hint of liquorice and secretly I was applauding in my heart with the joy of no liquorice lingering in my mouth. I could have asked not to have the leek on the dish but I still wanted to have every elements remained on the dish without ruining anything. 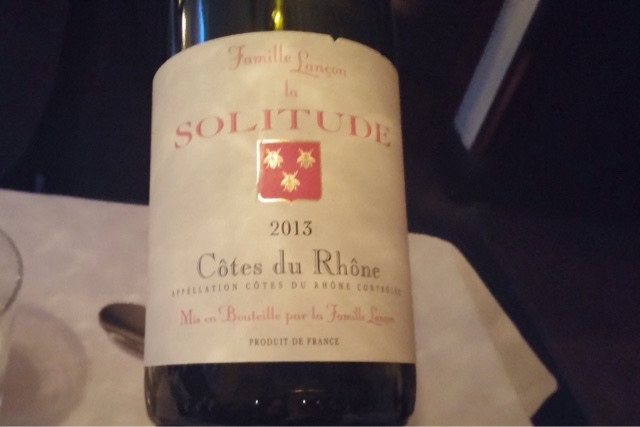 Good matching wine (Côtes du Rhônes, Famille Lancon la Solitude, France 2013). If you asked me what I drink during Christmas, it's definitely not mulled wine. I don't like the spices in mulled wine, it really ruins the wine. 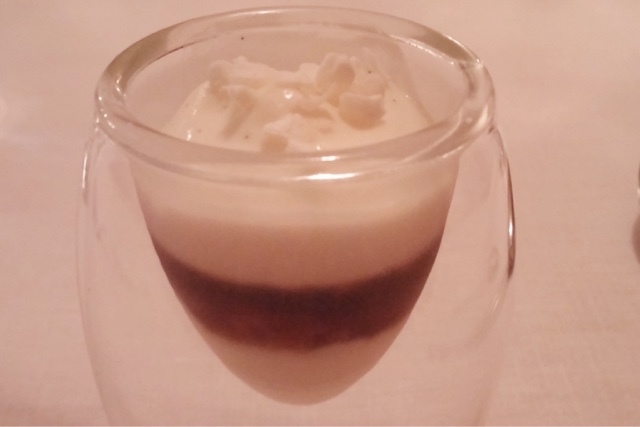 The layer of mulled wine jelly surprised me in the trifle, not overly spiced and can still taste the wine. Surprisingly I liked the trifle more than I thought. Pied á Terre definitely have done a good job on adding the flavour of things that I don't like but when you have a taste of it, the disliken flavours are not brought out strongly meaning I can eat the dish. 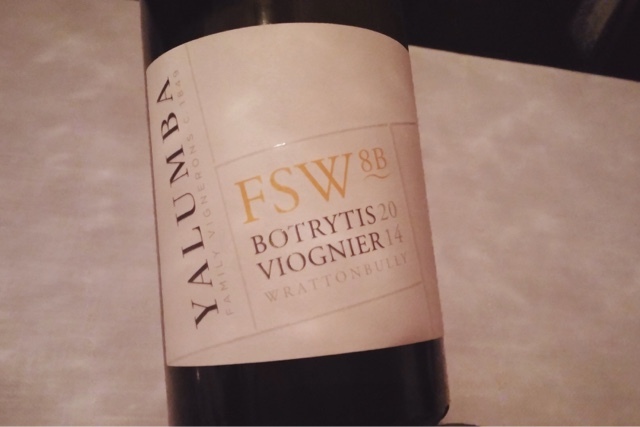 Paired With a sweet wine (Botrytis Viognier, Yalumba FSW8B, Australia 2014) that adds extra sweetness to the dessert. Triumph dessert, everything tasted so light and the right sweetness. The peanut ice cream was like an iced cold creamy but extremely light peanut butter. If I can I'd love to have a whole scoop of it. Even better, sandwiched between a fried bun and you get a peanut butter ice cream bao. 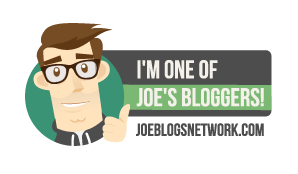 I think I just suggested something new, don't steal it. The chocolate mousse just melts in the mouth, not overly sickly chocolatey, immensely light. Everything is just so perfect. 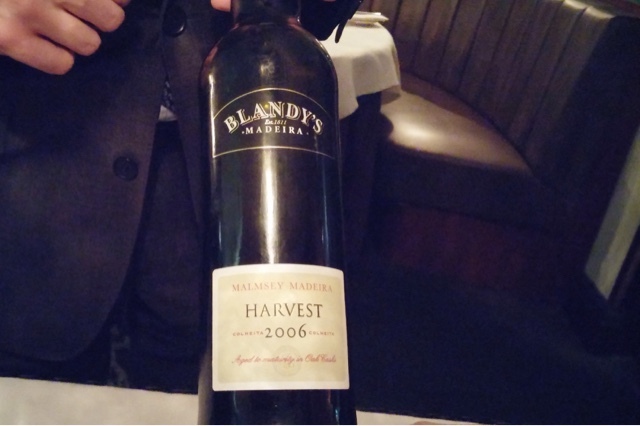 What took me by surprised was the wine (Madeira, Blandy's Malmsey Harvest, Portugal 2006), it smelts like a port with a bit lighter body than a port and it tasted very similar to port as well. I think I just find a new alternative to our port obsession, Madeira that is. 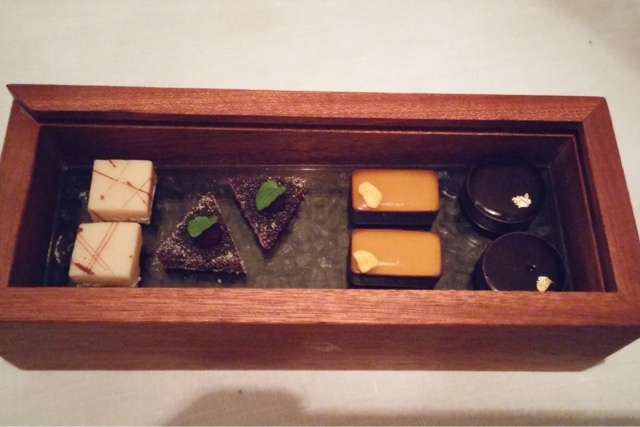 Petit Fours - White Chocolate truffle, Pâté de Cassis, Passion Fruit and Rum Truffle and Lapsang Souchong Ganache. I hoovered up my desserts politely and when you thought it was drawing to an end, more comes along with the line of petit fours of 6 different varieties. Every single one of them was so fine and delicate that you don't even want to touch it. 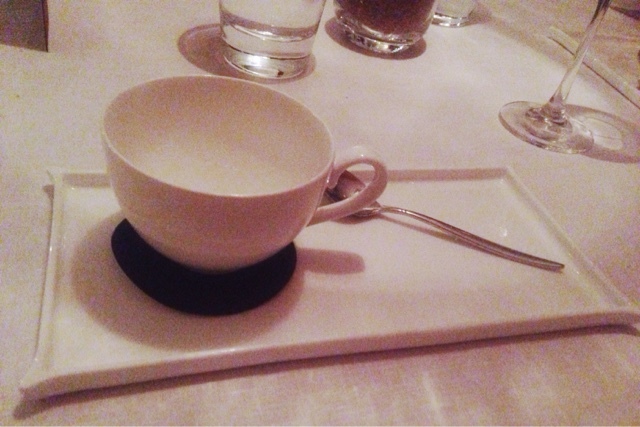 Loved the lapsang souchong ganache. 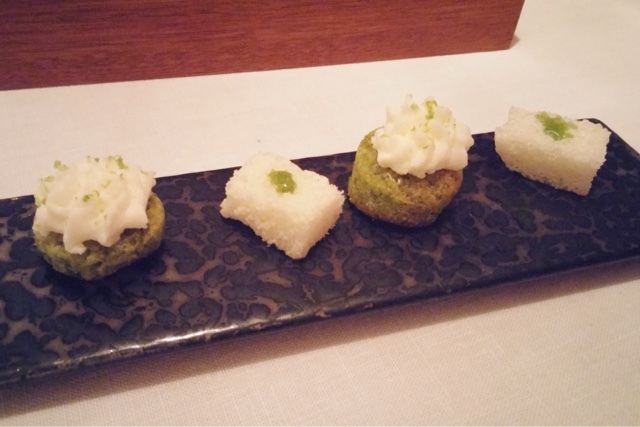 I can't remember what the green thing was but the marshmallow was a texture that you'd never experienced. 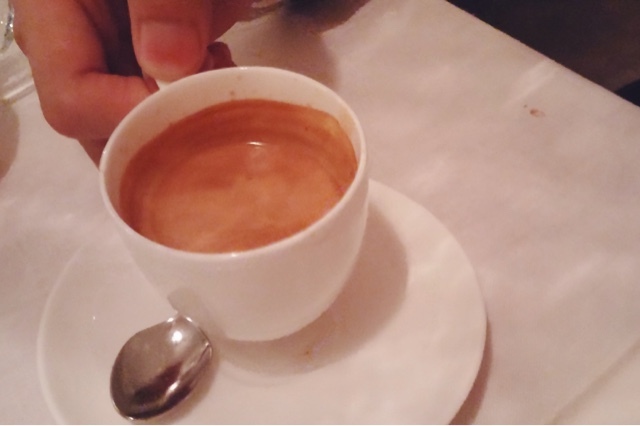 So soft that it melts in the mouth, it was a threat to disappearing on the fingers. This is not like your everyday marshmallow. We also had a pot of ceylon and a double expresso. 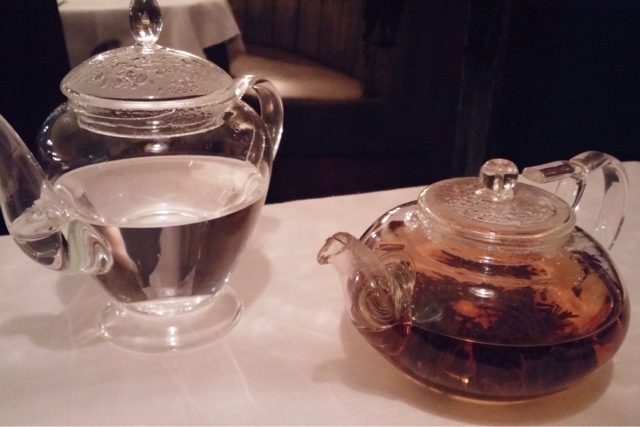 At one point, I wanted to take the teapots away with me. That's how much I liked it but now I do know where to buy it. Betjeman and Barton is a tea brand that I have not heard of before, it's one that I am on the look out for now because it's good. Looking down the watch, it has gone past 9pm. How did we eat for 3 hours, it went so quick. Pied à Terre is good. I mean very good, food and service was faultless. This would probably be the most attentive service we've received in any places. Imaging being in a restaurant and at most the maximum was 4 tables that was dining. Service can't go wrong, right? There won't be a buzzing atmosphere, well it was not exactly busy. I do like a quiet room for dining sometimes, without distraction and no music playing. My suggestion to experience the impeccable service is to dine on a Monday. Sophisticated decor with bits and bobs of modern touch to it; low light hanging on each table and with the table booth area like, it's perfect for a cosy couple. 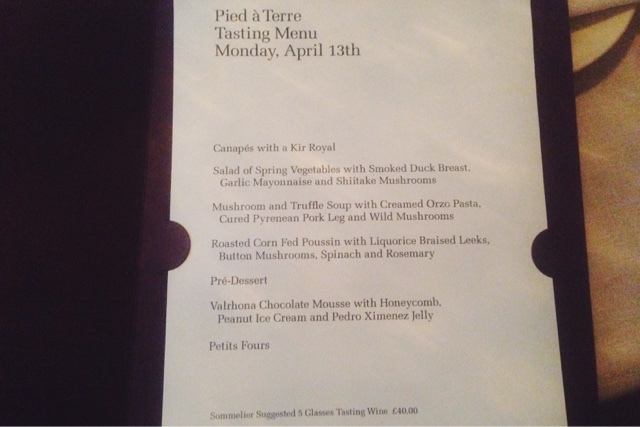 You can tell I've enjoyed the meal a lot, biased to say I like Pied à Terre more than L'autre Pied. What's even better is their ability to matched such fantastic wines to such tasty food. Hands down to the sommelier.